I knew it was time to get back on the trail when I was upset that I didn’t have enough time to get an acai bowl before my Thai massage. A two week break became overwhelming. There is so much phone service on the grid! So much internet. Is it really necessary? I guess I’d find out, though I already knew the answer. 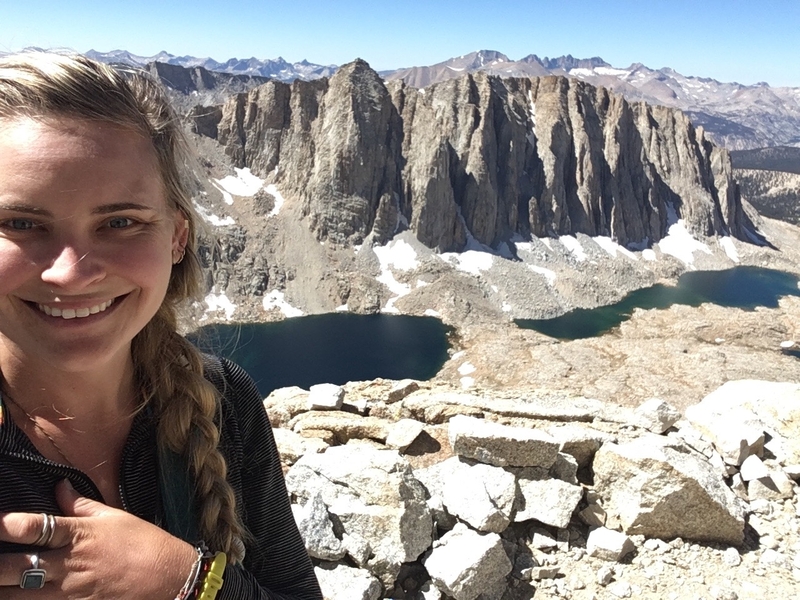 In my first stretch in the Sierra, I turned 28, summited Mt. 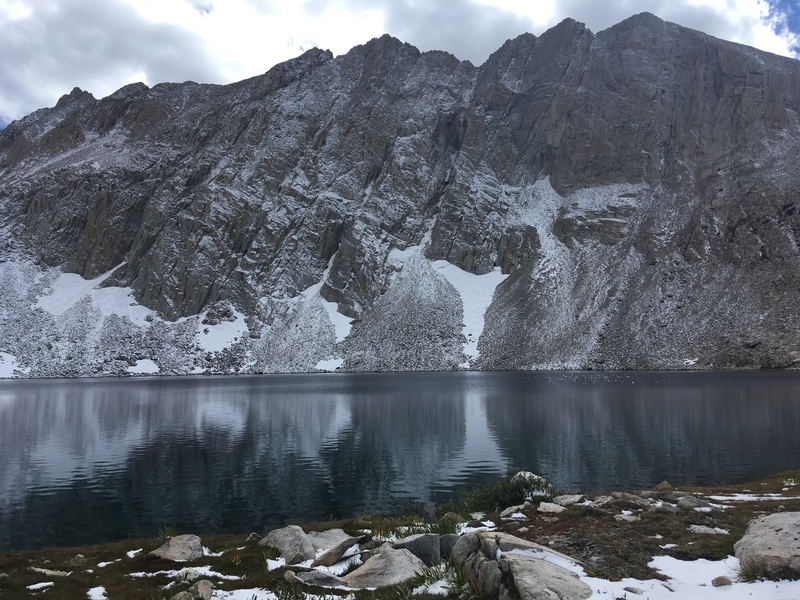 Whitney, climbed to the highest elevation on the PCT (13’200), and survived my first backcountry snow storm and sub-freezing temperatures. I forded creeks, saw bears, met incredible people and reconnected with old trail friends. My dad drove me up to start out the Sierra section, my first planned stretch would be 10 days off the grid. 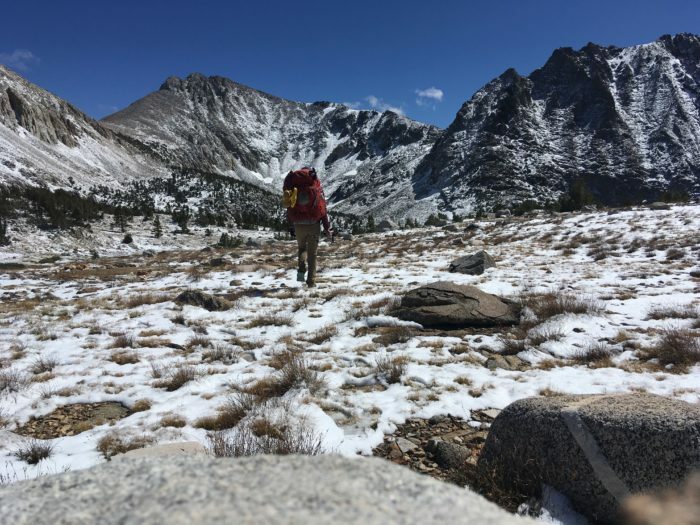 Many resupply points close in the Sierra at the end of summer, so I’d be doing some long and heavy carries between towns. I’m a pretty big fan of words, and especially authors who know how to use them, but I don’t think there’s an author out there who could properly wordsmith the experience of the High Sierra. I’ll do my best, but really it needs to be seen in person. The Sierra is a land of light and water, a secret haven high above the desert floor. 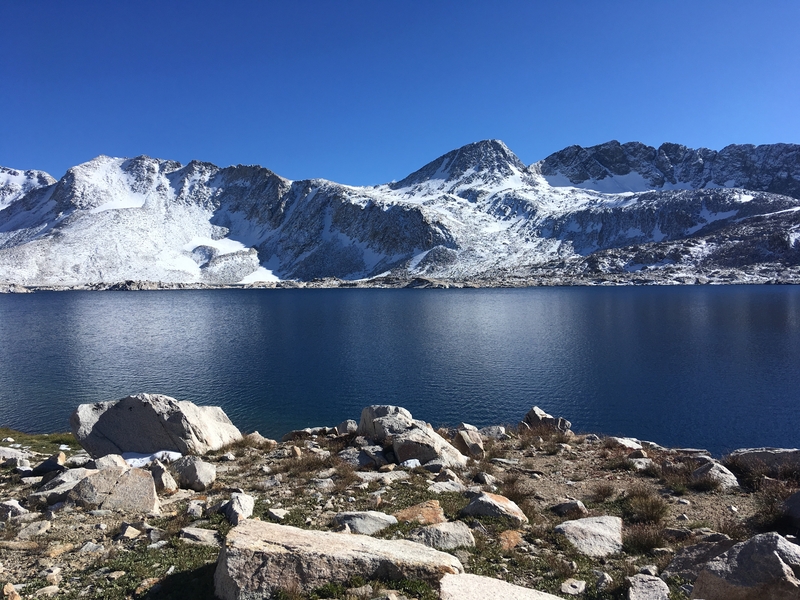 It’s a deluge of granite, of captured light that produces a different photograph of the same location every hour of the day. Its torrential beauty weaves along high passes, climbing from snowy peaks to low meadows. 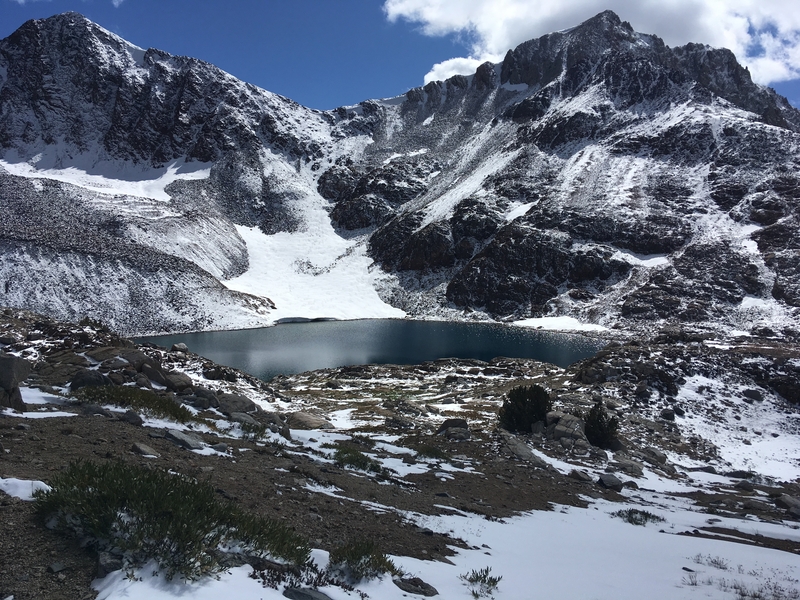 I hiked along the corridor of nature’s purest form, from the snow-covered passes that feed the streams that feed the lakes that feed the plants that create the meadows that feed the animals. This place is Mother Nature’s heartbeat, and it delves to a level that simply cannot be recreated between humans. It’s an experience reserved exclusively for man meets wild. This section is extremely challenging not just because of the high elevation, but because of the tremendous climbs. Some days would take me from eight to twelve thousand feet and then back down again. 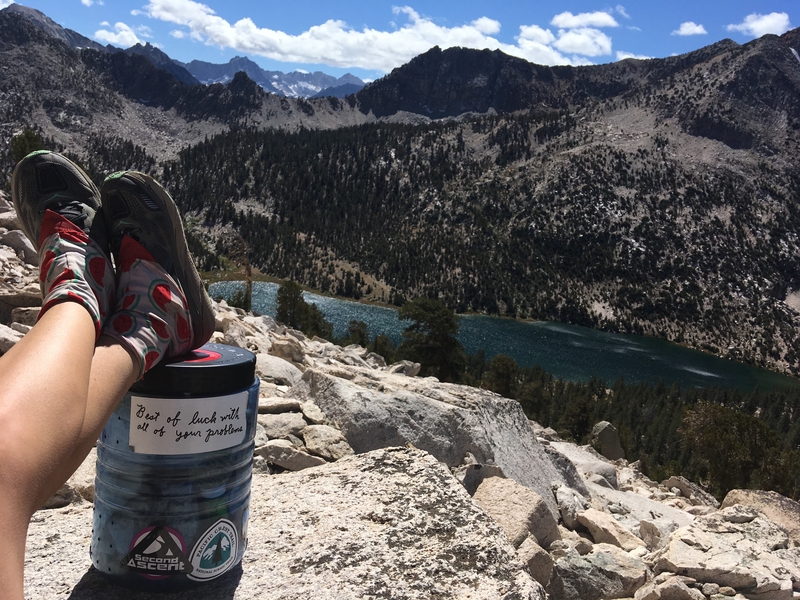 There is no walking in the Sierra, only climbing, only descending. The added weight of a bear canister – plus more food than I’d ever carried – made it all the more interesting. Although Mt. 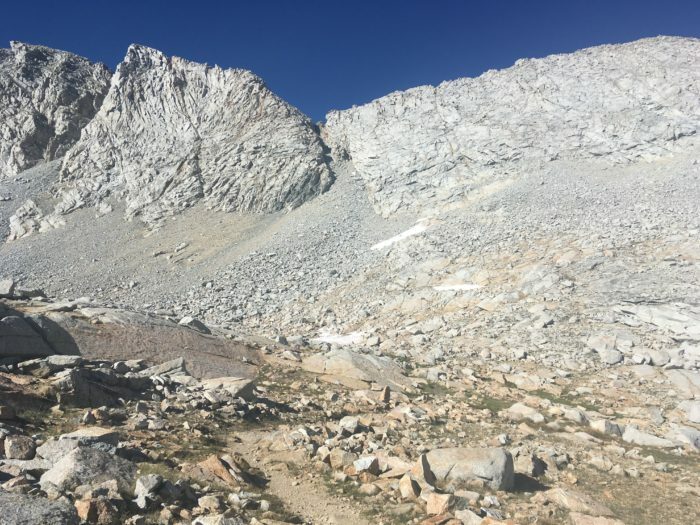 Whitney, the tallest peak in the lower 48, isn’t officially part of the PCT, thru hikers are encouraged to do it because “it’s right there” and “you’re in the best shape of your life.” So I camped the mandated 7.5 miles away and rose early to attempt the summit. The best part? I could leave my camp set up and only needed to carry a day pack! I’d been looking forward to it for weeks. PCT hikers climb Whitney from the west side with, as my friend Ben says, “the cool kids.” Most people climb from Whitney Portal on the east side. For those who haven’t attempted the summit from the west, it’s gorgeous and I’d highly recommend it. In any case, I absolutely flew up that mountain, it was unreal. “Go speed racer!” “Did you see her pace?” “Go go go!” and “You’re truckin’! 10 minutes and you’re there!” were all shot my way as I practically ran the last two miles. Now, I’ve never ever been an athlete, so this climb was especially amazing for me. I sat leaned up against the shelter on top, watching a woman step the final 50 meters towards me, taking a step and then stopping to lean on her poles and catch her breath. It was hard to watch so many people struggle their way to the top, but nice to have their happy enthusiasm towards PCT hikers too. Glad to have the tallest mountain in the lower 48 crossed off my list! 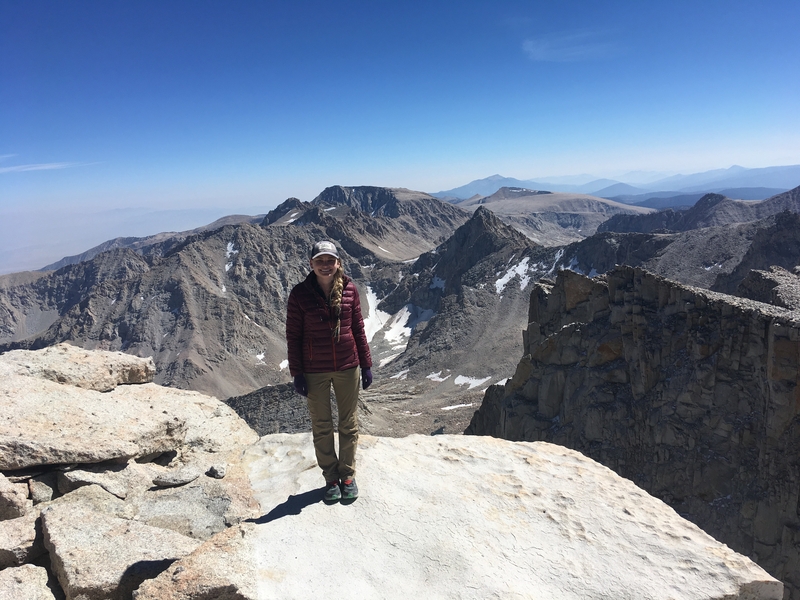 The next day, I climbed to the top of Forester Pass, the highest point on the PCT at 13’200 ft, and cried in surprise at what my body is allowing me to do. Big, happy tears. 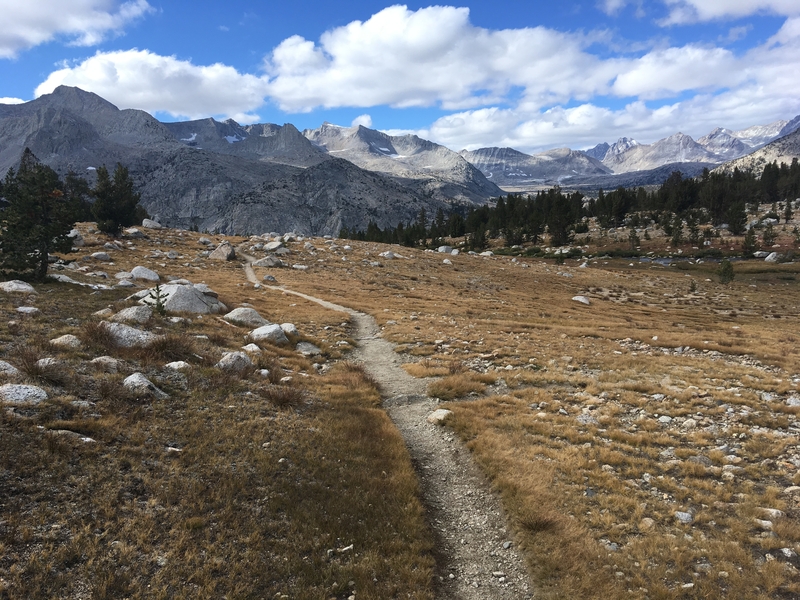 A 16-mile day, then a 15-mile summit of Mt. 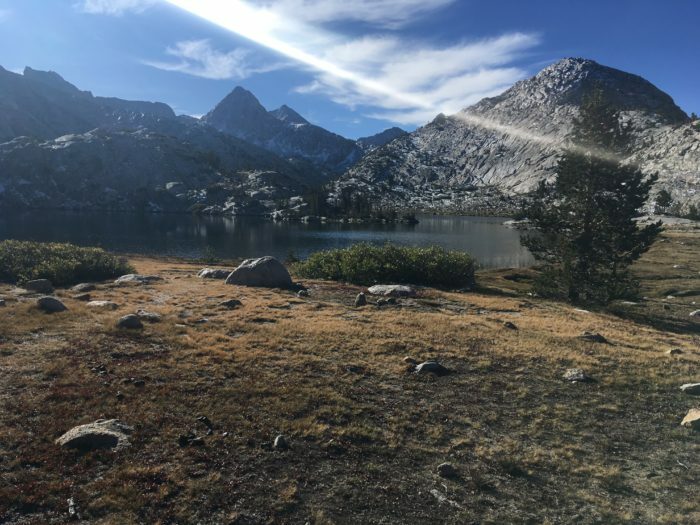 Whitney, then an 18-mile day with a four thousand foot climb to the highest elevation on the PCT. They say mileage goes down in the Sierra and it sure does, but I guess we really are in the best shape of our lives. One thing that always plagues me at high altitude is a bloody nose. And because I’d remain at high altitude for over a week, I was blessed with a perpetual bloody nose. It struck as I was climbing Whitney, though I hadn’t realized it yet, and the lady in me has a habit of snot rocketing. This is basically just plugging a nostril and blowing really hard out the other, but not into a tissue. Into the wilderness. Usually I’ll blow a snot rocket and then sing ‘Snot Rockets in Flight! Dwoooop!’ to the tune of that Afternoon Delight song. Anyways. Whitney. So I didn’t realize my bloody nose was coming on and I snot rocketed pretty hard onto the wall of the final switchbacks, just absolutely spewed blood all over that thing. So if you’re ever climbing Whitney and find a murder scene on the wall, that’s my tribal art. Kate, a tribe of one. Coming down from Forester Pass, I camped with some Southbound hikers who were talking about a cold front coming on. Had I heard about it? No, but from looking at the summit forecast for Whitney, I knew something was up. Rumors were flying – about how long it would last, whether it would snow, how much snow would fall, etc etc. The next day, I climbed over steep Glen Pass as the wind howled around me, watching storm clouds roll in. 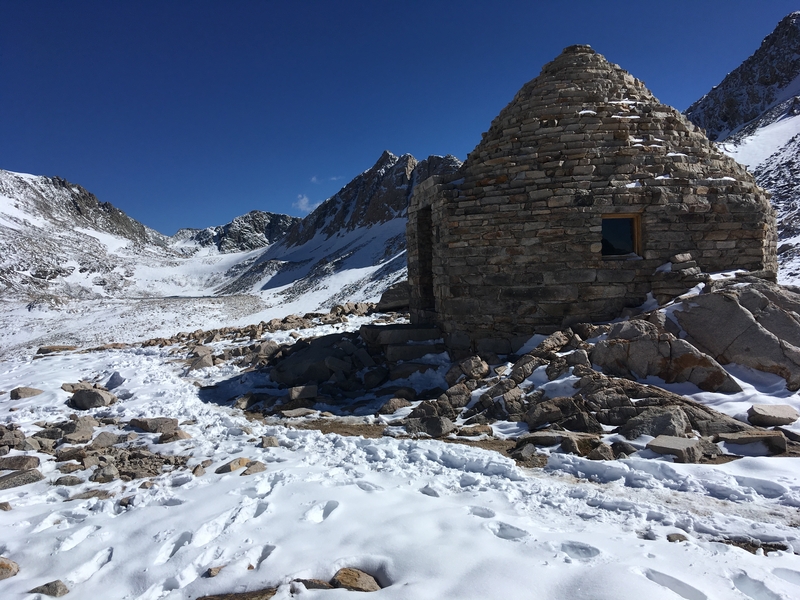 I stopped in at a backcountry ranger station and a young guy bopped out and said I’d be fine, “just don’t try anything epic” and the snow will melt off within a day. Alright. 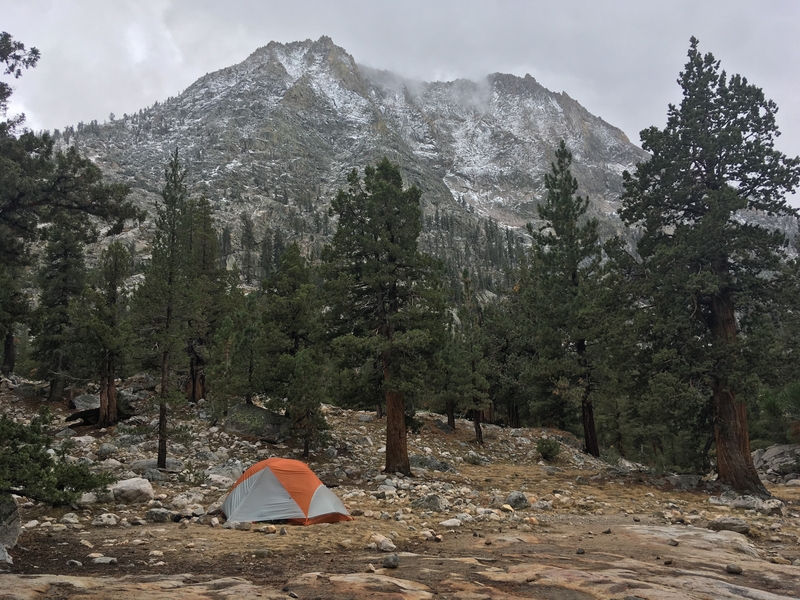 So I camped around 10’000 ft and the storm blew in around 6am on my birthday, dumping snow. I decided to hike the four miles down to a lower elevation and wait it out, so I crawled out of my tent and packed everything up as quickly as possible to make the frigid descent. It snowed, hailed and slush-rained all day while I read from the warm cozy comfort of my tent. All in all, it was about eight inches of snow, but drifts went up to our hips in some places. And thus originated the question of the week for those headed in the opposite direction: How was the pass? 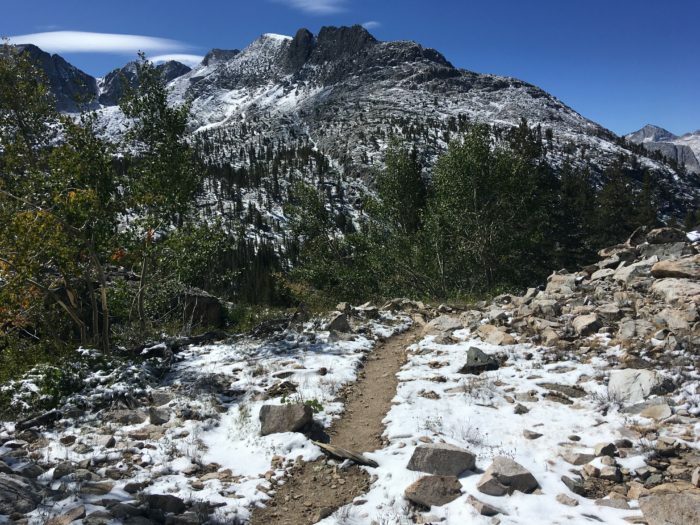 Because all we do is climb and descend passes, something like a snowstorm can be detrimental for hikers without snow or navigation experience (a rumored two thirds of JMT hikers dropped out). I was stuck at a low point between passes, so my only option was onward, upward. The bad news for me, heading north, was that the north faces of the passes would melt off slower. 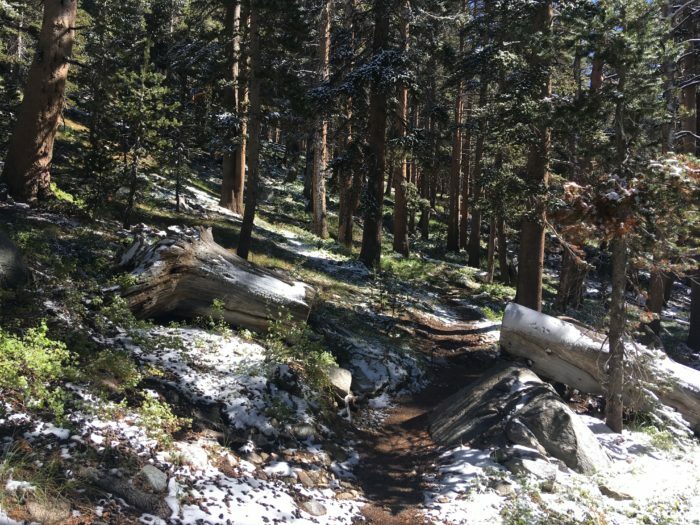 This meant snow-free climbs but slushy, icy, snow-covered descents down steep passes. Was I ready for that? Some were harder than others, and the snow took much longer than a day to melt off (it’s still out there), but I made it through. There was some slipping and sliding and a little bit of navigation, but overall it almost made the experience more fun, and certainly all the more beautiful. What was NOT fun was how cold the nights and mornings were. I had one 17 degree night, wrapped in five layers and three pairs of socks while I slept. I gave up on early morning starts during this period and just let my body tell me when it was ready to emerge from my sleeping bag. Ding! Like a roast turkey. Yum. Some mornings, my tent poles had frozen together at the junctions, so I had to breathe hot air on them to get them to unstick and pack down. Type 2 fun at its finest. Many of those reading this blog have likely heard about the deaths that occurred this year when two young women attempted to cross raging rivers when the snow melt was at its peak. When the snow storm came through, one of my initial concerns was what it would do to the water levels at the creeks I’d have to ford. Thankfully, and almost eerily, I crossed these once-deadly creeks and hardly got my feet wet. The one exception was Evolution Creek, which is renowned for being deep and even has an alternate crossing for high snow years. I took the alternate and croc o’clock came early when I was forced to ford the river in my crocs. The crossing probably lasted a full 15 seconds and only went up to my shins, but heck if I didn’t spew out a string of every curse word in my arsenal. That water is damn cold. My feet were blocks of ice within a second of stepping in the water. Oh, the wilderness. Four days after the snow storm, I climbed out of a meadow on my way up to Muir Pass and found myself on a granite slope in the sun. Finally, finally it was warm enough to wear shorts! For the past few days, I’d been hiking in pants with polartec liners. It was time to release the legs, the fuzziest they’ve been since elementary school. The temperatures kept warming throughout the week and by the end of the section, I could sleep without my down jacket on. One thing that’s nice about the Sierra is that it’s not nearly as dirty as Oregon or Washington. I don’t feel like I need to scrub dirt off myself every night. 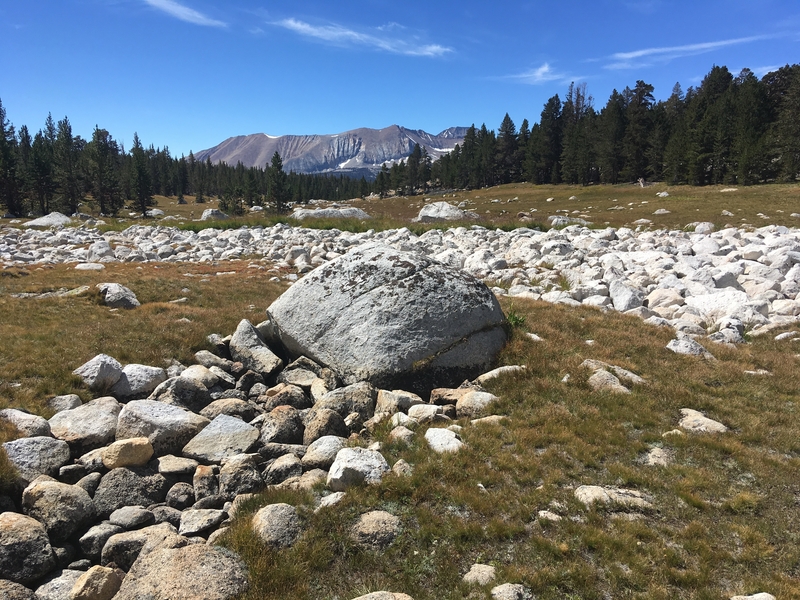 As I continued north, I figured it was mostly due to the well trodden path and the granite everywhere. As I neared Yosemite, I started noticing the gradual signs of the renowned national park. The bluish-purple hues of the horizon, traversing giant slabs of rock where it blended with the trail. And I love, love, love the smell of granite on my hands. 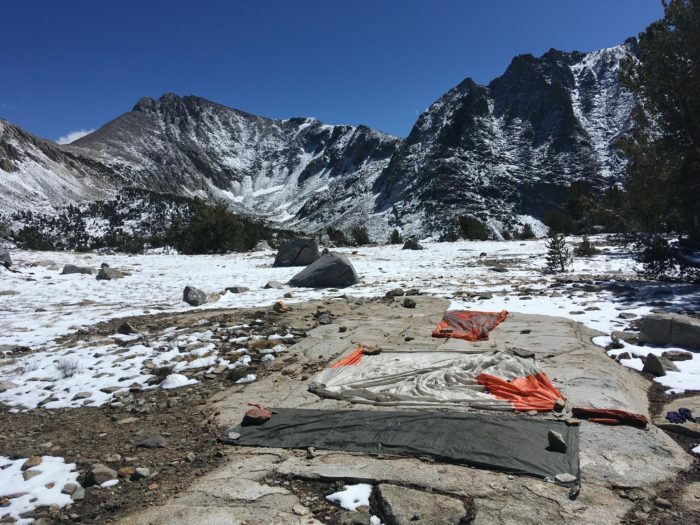 But my main point is that I stayed pretty clean, so when I hit my first resupply after 10 days and the woman asked me if I’d like to shower, I said I’d made it 10 and could certainly make it the 12 days to Mammoth without showering. Embrace the dirt. 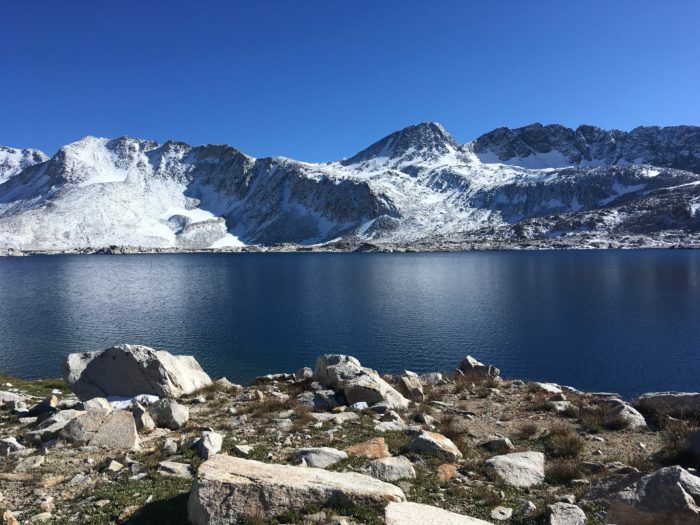 The PCT joins up with the John Muir Trail for a good portion of the Sierra, and the JMT falls in a kind of strange category between thru hiking and traditional backpacking. The JMT is over 200 miles, but the hikers often carry a ton of gear, wear heavy boots, do much lower mileage than PCT hikers and seem (generally) to not have a real flow in the backcountry. I was asked way too many times by JMT hikers how far it was to this, when the next water was, where they could camp for the night, how big of a climb this was. I’d grown used to PCT hikers, who are ridiculously self-sufficient. 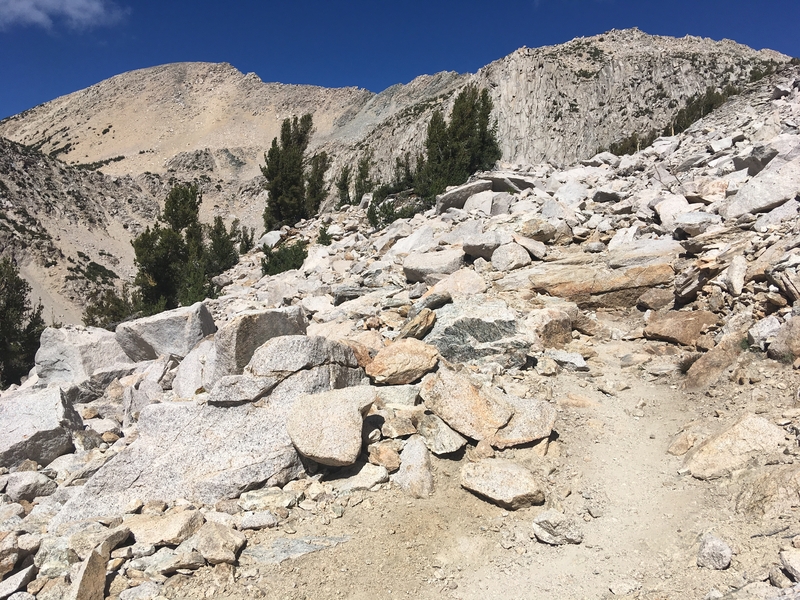 But one thing that can be said about JMT hikers is they’re a serious boost to the ego. 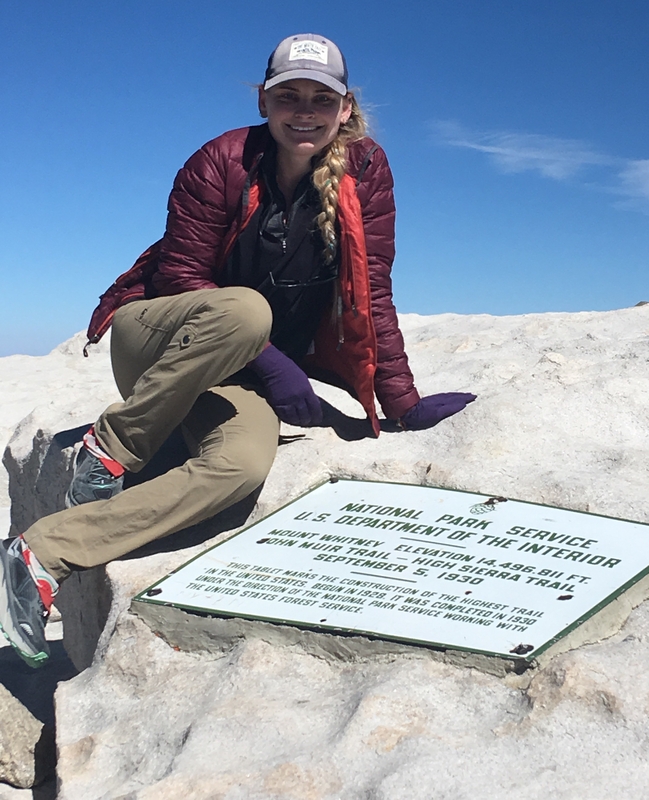 When I pulled into camp the day after I summited Whitney, a group of JMT hikers gathered around me and said “You summited Whitney yesterday?! 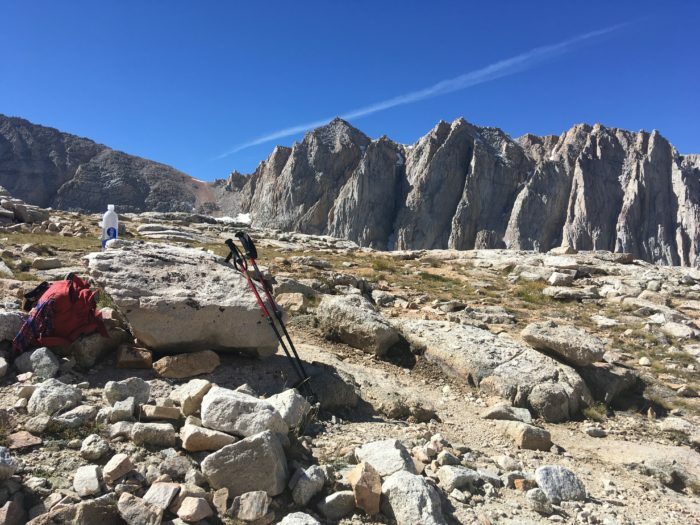 We won’t be there for another three days!” And they talk about how small our packs are and how little we carry and, all told, are an impressive little bunch of rascals themselves. 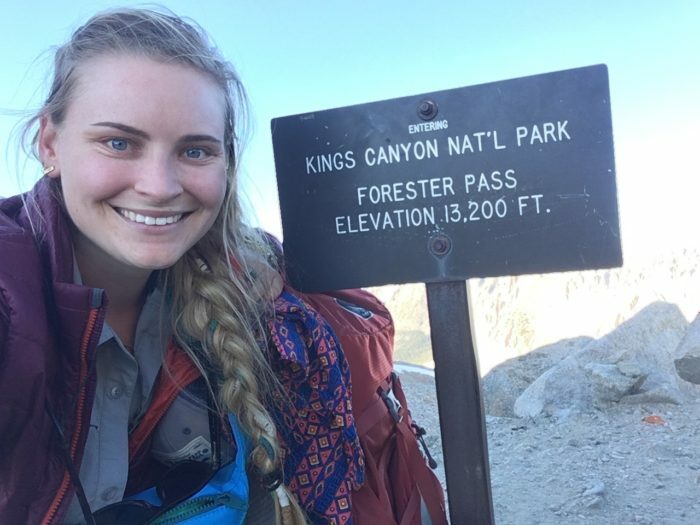 Heck, they’re signing up for 200 miles of some of the toughest terrain there is, often without the warm up that thru hikers get. But if someone could get them some maps and a compass or something that’d be great. 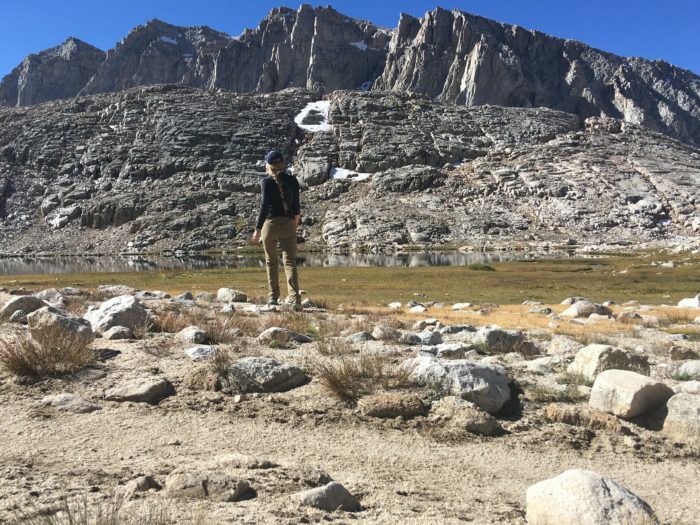 Because people ask me all the time if I’m afraid to be out there alone, I’ll share the three things I’ve come to actually fear on the trail: bears, darkness and marriage. Let’s break it down. Well I have to carry a bear can through the Sierra, so one thing’s for certain – they’re out there. I’d never seen one in the wild and wasn’t stoked at the opportunity. When I’d get into heavily wooded areas, I’d start to whistle, which I’m really bad at. So then I’d start singing Christmas carols, but the only one I could remember was Feliz Navidad. Is that even a carol? And when I came across A-Game a few days in, she said we were the only two who hadn’t seen a bear yet. So it was at the top of my mind for the next few days and as soon as it slipped below the surface, a loud rustle started to my left and I saw a cinnamon bear run off into the woods a few trees away, quickly followed by a little black bear who was working his way down the tree like a fire pole. Turns out they’re awesome creatures, absolutely gorgeous and terrified of us too. And even though I still don’t want one anywhere near my tent, it was incredible to see them in the wild like that. As the days get shorter, some hikers opt to night hike by the light of there headlamps. No thanks. I mean, bears…and darkness. I haven’t alleviated this one, and really I prefer to be hunkered down in my sleeping bag before the last rays of light disappear. Everyone always talks about seeing pairs of glowing eyes attached to unknown animal bodies when they night hike. Yeah, nope. So when one of my headlamp batteries exploded in the cold, thankfully Casey came to my rescue with a full unopened package of AAA batteries and we got it working again. Hallelujah! So I turned 28 this last stretch. I should be married by now, right? Or pregnant or something? In a serious relationship where every once in a while I give my boyfriend the eyes to let him know that my ring finger is feeling a little light and are we doing this or not? So often marriage is seen as a goal, a checkbox, instead of a process. The trail manifested this fear pretty early on. Heck, life manifested this fear pretty early on. But especially out here, I’ve seen relationships form and fall apart. I’ve seen the sadness and tears behind glowing instagram photos. I’ve seen fights and sacrifice and compromise, and as a solo traveler I get none of that. 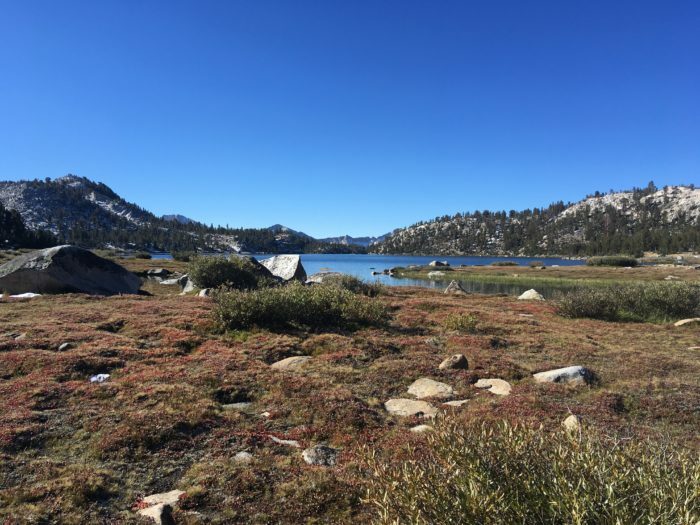 When I come across hiker pairs and they ask me about the solitude, I say it’s incredibly nice to be able to stop when I want, camp where I want, eat when I want, go as fast or slow as I want without having to worry about the needs of a partner. I always, always get a hearty nod in response to this. So why the marriage fear? Well I’ve had friends say ‘gosh, I really want to do the trail, but I’m married now.’ And I’ve seen people sacrifice the truth of who they are just for the sake of not being alone on the trail. I know two women who hiked the PCT with partners while in complicated romantic relationships, and wouldn’t you know it, they hiked it again – alone – after those relationships had ended. That’s how different it is to walk this trail in solitude, and that’s how much something like a relationship can alter it. But don’t get me wrong, I’ve met people out here who are in wonderful relationships, but they are rare, rare, rare. And for those of us walking alone, who have now learned to live life not selfishly, but truthfully – in unabated representation of who we really are and what we really want – the idea of attaching permanently to someone for the sake of not being alone becomes silly. The fear isn’t in being alone, it’s in sacrificing our true self for the sake of a relationship, for the sake of having a family. I’ve had friends suffocated by partners who’d been cheated on in previous relationships, but they stick with them ‘because they asked and I said yes’ or because they want a family and the clock is ticking. 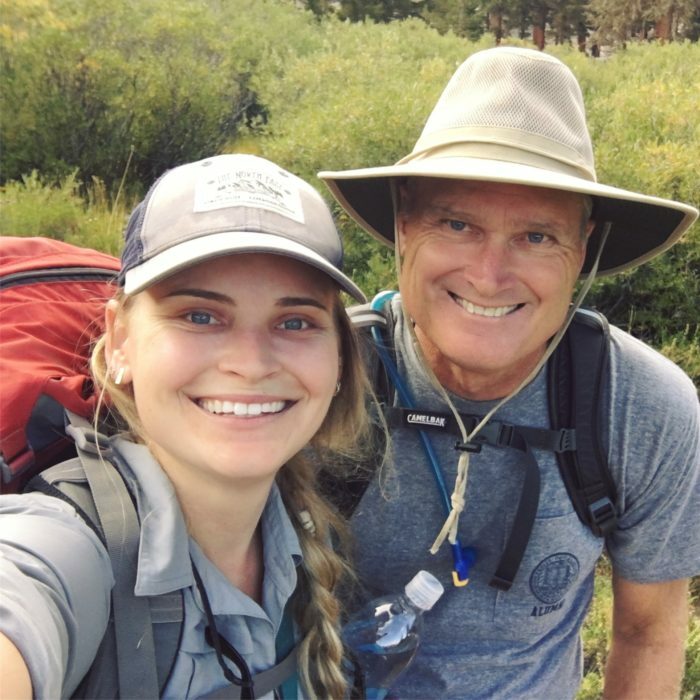 I’ve met a couple guys on the trail (yes, men!) with similar thoughts. We’re in a generation navigating our way beneath the divorced generation above us, wondering what we can do to change the outcome. I once heard the phrase ‘healthy interdependence’ for the space between independence and dependence, and I liked it. 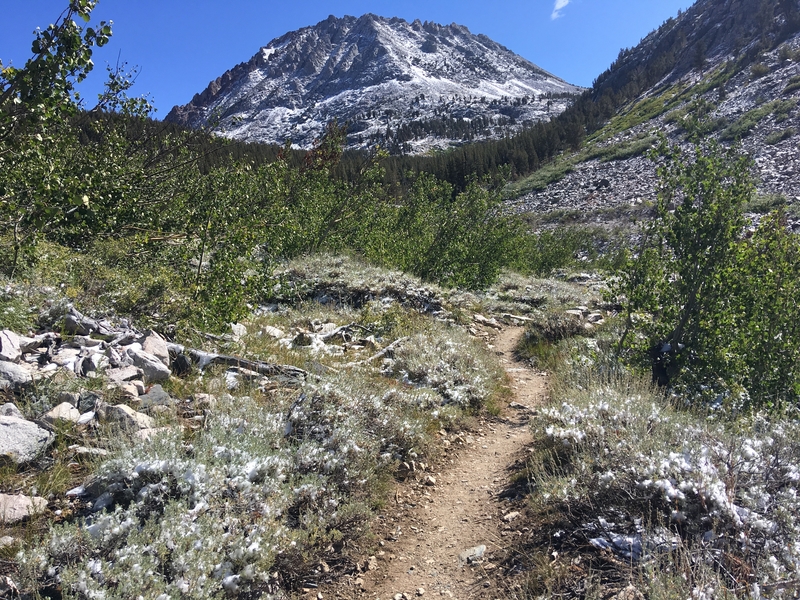 Something about being on trail has made me more resolute in what I’m seeking, and hopefully less likely to engage in relationship musical chairs, where the music stops and we settle for whatever romantic partner is in front of us at the time. Cheers to hard truths. I love Kate’s writing and would gobble up more! Great writing. Love your trip report. I love your writing Kate. Looking forward to seeing more of your words and adventures. I plan to thru hike the AT this spring. Take care ?